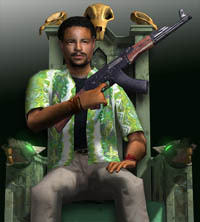 Markus created videogame-character versions of Cedric The Entertainer and a villain for the movie Code Name: The Cleaner. In the story, Cedric (as a spy) has a "Signature Move" that is his secret weapon - but he may just have copied it from a video game! The characters were used in a mock video game setup in the film to illustrate the special move. Markus used Maya to model and rig the Cedric character based on still images shot by the film production crew. The low-poly video-game look was key to the plot point in the movie. The series of fight moves, defining cedric's signature move, were animated in Maya. Markus based the motion on multiple film references. The villain and his weapon were also modeled after an actor with textures based on wardrobe clothing. Two versions of the animation are featured below. One is the version as it appeared in the movie. The other is the complete signature move, in pre-shaded form.